Revival at First Pentecostal in London, Kentucky has been going great this week. There has been good response in the altar every night. I am always thankful when folks are touched by the Word of God and come to the altar as a result. Praise God for His help. Tomorrow we should have some pictures from revival here in London. 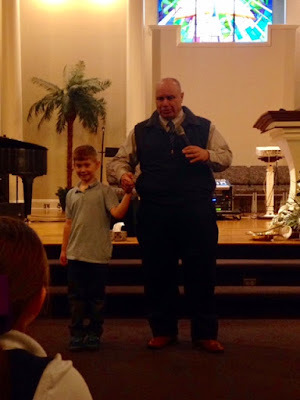 They have a good sized Christian school at First Pentecostal and Wednesday was Chapel day. Odie was going to talk to the students but she was not feeling well. I was her last minute replacement and I enjoyed it very much. It is a great opportunity to preach to young hearts and I love to watch God move on them. This young man was kind enough to help me when I needed a hand. All is going well with the BoggsMobile in Tennessee. Those of you that know me well, will probably be surprised to know that I have not been down there at all since I left it. I have a terrible long term case of Bus Induced Psychosis, BIP for short, but it is controllable with prayer. The effects are also lessened when the bus is in good hands. The BoggsMobile is definitely in good hands with Jeff Rowe at East Tennessee Luxury Coach. He treats the bus as if it is his own and he understand my BIP. I do miss getting to see how things are done. I am curious, especially when it comes to the bus, and I have learned so much from Jeff and his men on previous visits. That makes it hard to stay away but I must be faithful to my duties here. Speaking of duties, it is time to get after it. I have a sneakin' suspicion they are going to want me to do something spiritual tonight. Have a great day. Thanks for reading.